On March 28, HB 274, as amended by the Senate with the informed consent language of SB 102, was received in the House and sent to the Rules Committee. Three days remained in the legislative session, more than enough time to bring the bill to the floor of the House for concurrence. Only one thing stood in the way of this bill being sent to Governor Beshear for signing: the 5 House Leaders. Our hope ran high. These 5 leaders had all promised the Catholic Conference in two separate meetings to bring this legislation to a vote of the membership. Two days scheduled for concurrence left plenty of time to see this bill pass. After the two days scheduled for concurring in legislation lapsed without it being passed, the House and Senate adjourned for 10 days. Now only one day remained for this bill to pass. 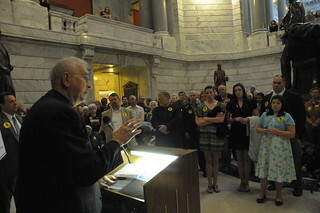 On the morning of April 12, the very last day of the session, 200 supporters gathered in the Capitol Rotunda to urge these legislators to keep the promise made to the bishops and let their members vote on this bill. Archbishop Joseph Kurtz led those gathered in prayer and expressed the need for the passage of this legislation so that women considering an abortion would have access to as much information as possible through a face-to-face meeting with a health care professional prior to agreeing to the procedure. As the hours of the final day slipped away, hope for passage dwindled. At 11:59, the House adjourned sine die and HB 274 remained in Rules. Sadly, the promise made to the bishops was not kept.